Summer has hit DC and things in the area’s rental market continue to heat up! As we’ve seen over the past few years, rental prices in our Nation’s Capital again increased at a rate nearly twice the national average. Since June 2015 rents in the District rose 3.6% verses 2% nationwide. 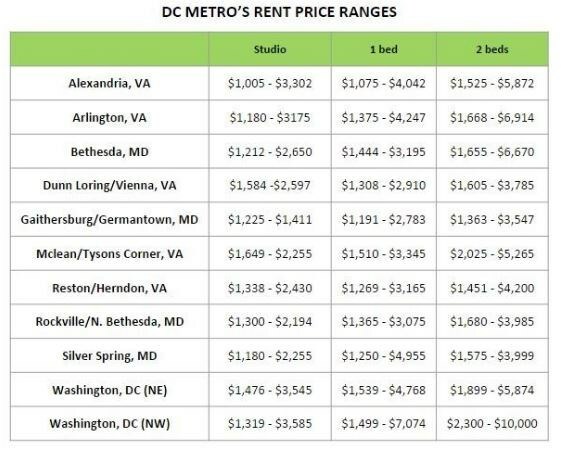 In DC the average one-bedroom unit will set you back $2,100 while a two-bedroom apartment comes in at $3,100. The boon in prices can be seen most clearly in up and coming neighborhoods that are drawing a crowd seeking trendy shops and restaurants, new development and easy access to public transportation. Mount Vernon, NoMa and H Street all saw rental increases topping 7.8% since last June! But these areas don’t hold the crown for most expensive neighborhood in the city (yet). That title goes to Foggy Bottom. This venerable neighborhood includes George Washington University and West End and has average rents of $2,400 and $4,200 for one and two bedroom units respectively. In the city’s popular U Street corridor one-bedroom apartments average $2,900 while two-bedroom places run $3,500. Living in this neighborhood allows residents seamless access to much of the city with scores of public transportation options and great walkability. For years, Dupont Circle has been one of the most consistently sought after neighborhoods in DC and the rental prices mirror that desirability with averages for one and two bedrooms hitting $2,400 and $3,400. Further north in Columbia Heights, rental prices also continue to rise – 1.2% in the last month alone! One-bedroom apartments are averaging $2,100 while two-bedrooms carry a price tag of a cool $3,000. As people continue to flock to DC and neighborhoods continue to see rapid development, rent prices will likely only continue to rise. Figures in this report use data from ApartmentList.com.